Memories Page Starters, p. 44: "your current schedule and routines"
They encourage readers to submit layouts, both for publication and for the blog. When I sent this page in, they were kind enough to put it up on their blog last week! You can see that post here. Scrapbook & Cards Today has a strong online presence with a wonderful website and blog. You can subscribe to each issue in print form, or download it for free. I do both! I love holding the beautiful print version and turning the pages, but also enjoy the convenience having many issues right at my fingertips on my iPad. Are you already a fan, or is this magazine something new to you? Already a fan, and I love your layout included there. awesome layout and congrats on the blog! Congrats on being on their blog! Lovely page. I like how you scrapped a part of your weekly routine. Really like that row of brands and leaves. Congratulations on the feature, Sue. So well deserved! I like your morning routine (thinking about doing something just like it this morning) and love your layout! I saw it (and commented it) on their blog, it's a fabulous layout ! Lastly on another forum, we were sharing our favorite scrapbookers and someone told your name, of course I did agree, you're so inspirational ! Love your layout. What font did you use for the "Friday"? How cool that they put it on the blog! ITA, it is a very nice magazine! Very nice colors. I really like the leaves. 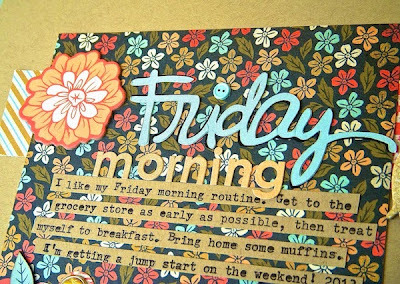 Would also like to know the font you used for "Friday," or is that a Kerri Bradford die cut? It looks so similar if it isn't! :) Great colors on this layout! The font is a shape I purchased in the Silhouette Online Store. It is called “Friday” and it’s by Loni Stevens. I do miss the print magazine for sure. Love your layout and the squares are such a lovely element! Beautiful job! I love that Basic Grey line and you did such a fabulous job with this!! Congrats on the layout being published on their blog. I love that magazine too! I agree it is sad to see our magazines be replaced by digital or collapse altogether. Love the layout, great fall colors. This is beautiful Sue! Love the mix of Fall colors and they look great with your photos! And that border you created with the brads and leaves is so fun! Congrats on having it featured on the Blog! Love the colors in this layout and I like how you scrap everyday moments. I just found this mag online recently. I may have to get the print issue. I, too, like to have that out on my table to flip thru when I need some inspiration. Great layout!